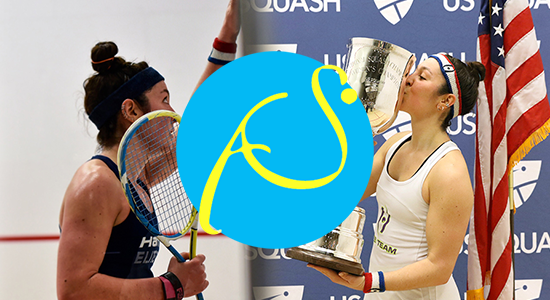 Egypt has now become the world’s leading power in squash, with England, Australia, and France also strong. A skilled Egyptian player can demoralize an opponent with, for example, “nicks and flicks.” A nick is a shot that, after striking the front wall, lands exactly at the junction of the floor and sidewall—and so rolls out on the floor, impossible to play and a winner for the one who hit it. Traditionally, nicks have been considered fortunate shots, but today’s top players have such precise control that they can aim for a nick and often make one. Flicks are shots that veer in an unexpected direction at the last split second. With a flick of the wrist, a player who is clearly set up to hit a “rail”—a long shot close to the wall—instead flips the ball crosscourt toward the opposite wall, tying the opponent in knots. In 2010 Sobhy, who comes from Long Island, became the first American to capture the World Junior Squash Championship, winning in Cologne, Germany, on her seventeenth birthday, June 29, by taking down Egypt’s Nour El Tayeb in a demanding final—“at the end of the match my lungs were about to explode.” Even before college, Sobhy was ranked first in the United States and as high as seventeenth in the world; she had won four U.S. junior national titles and five tournaments in the professional Women’s International Squash Players Association. Sobhy typically sets a blazing pace in her matches, which frequently are decided in 15 to 25 minutes. She has both foot speed and enough power (“I’ve got a lot of muscle”) to hit rockets off both the forehand and backhand sides. She speeds up play by volleying as many balls as possible; professional players can handle the dizzying pace, but many collegians cannot. Sobhy also loves drop shots; she now seeks to cultivate a more varied pace in her game, to “throw in some lobs.” An anthropology concentrator, she hopes to play professionally after college and some day open her own club. Farag hails from Cairo and completed a year at American University there before Harvard. Egyptian players have the advantage of being largely concentrated in Cairo; at Farag’s Heliopolis Sporting Club, he often plays with many of the world’s best, including Ramy Ashour, frequently the world’s top-ranked player in recent years. Farag aims high: his sporting idols, he says, are Roger Federer (yes, he plays tennis, too) and retired French soccer star Zinedine Zidane. In 2009, Farag was ready to quit the game and sell his racquet after a pair of devastating losses—a player he feels he should have beaten bested him instead, 3-0, twice in two months. But his older brother, Wael, a strong player himself, took over as his coach and a few months later Farag reached the finals of a national tournament. He captained his Egyptian team to the world junior title in Quito in 2010 and was ranked the number-one junior player in the world after winning the British Junior Open in 2011. At Harvard, he went 16-0 (he did lose six games over the course of the season) and swept all opponents en route to his CSA national championship, triumphing over Columbia’s Ramit Tandon in the final. During the regular season, he unhorsed Princeton’s defending national champion, Todd Harrity, settling a score for his family, as Harrity had handed Wael Farag a tough defeat years earlier. Naturally, Farag, too, was Ivy Rookie and Player of the Year.